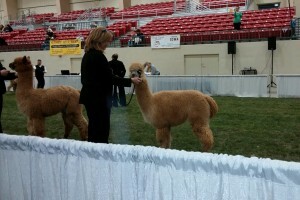 We just returned from the Carolina Alpaca Celebration. 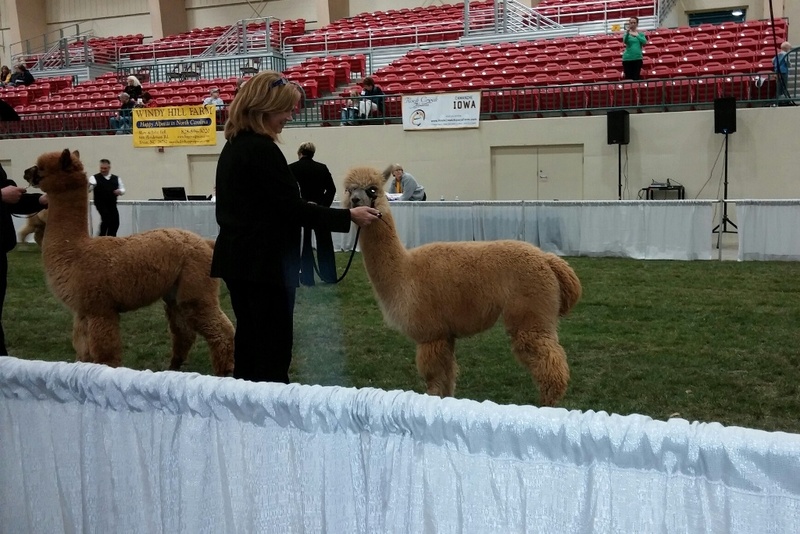 It was a fun weekend full of alpacas, seeing old friends, and meeting new people. 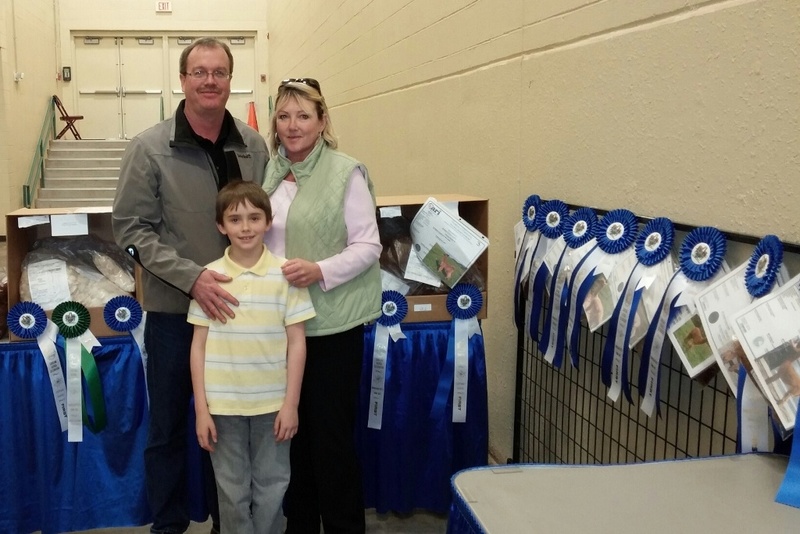 Wild Bells, Ninja and White Owl attended the show with me, and we shared stalls with Majestic View Alpacas and MacKenzie’s Meadows Alpacas. 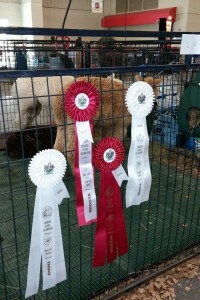 We were proud of how well our alpacas did in this large show. They earned second and third place ribbons in a variety of classes: Full Fleece Halter, Get-of-Sire, Bred & Owned, and Breeder’s Best Three. Our star of the show was Peaceful Heart’s Ninja, who placed third in a very competitive class of 9 true black alpacas. Judge Amanda VandenBosch said he was the “total package” with “good substance of bone” and “consistency and evenness” of fiber. 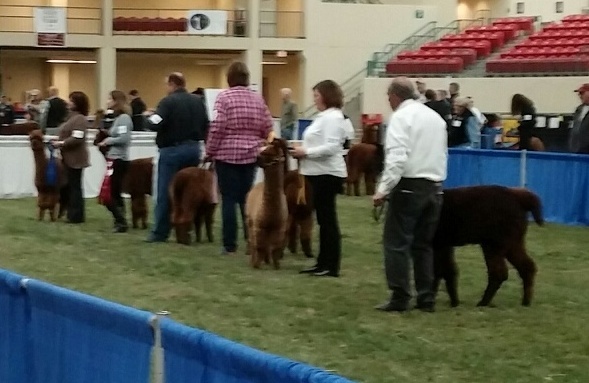 We enjoyed getting to watch not only our three alpacas in the ring, but also former herd members and offspring of our herdsires perform in the ring. 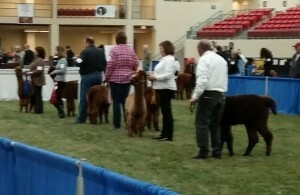 Its a Good Life Alpaca Farm did not bring their boys to the show, but their boys did great in the Spin-Off and Fleece Shows. Sir Galahad did particularly well, winning First Place in both Spin-Off and Cottage Fleece for white alpacas, and also Highest Scoring Alpaca of all the alpacas entered in the Spin-Off. Our latest building project was a relatively quick and easy project that has made a big difference for the youngest members of our herd. 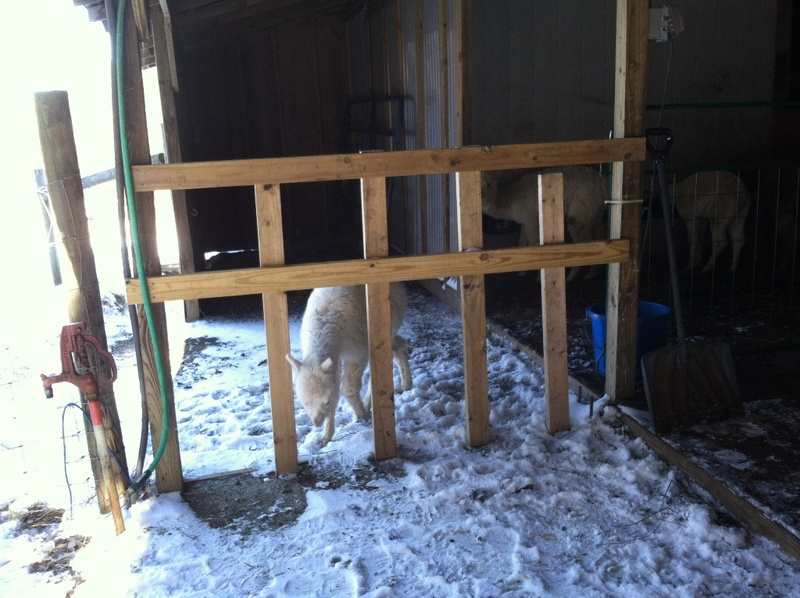 Last month, I built a simple gate to allow access into a small area of our barn which has been set up for feeding our weanlings and nursing crias. The creep feeder allows access only to the youngest alpacas in our mamas and crias pasture, so that our recently weaned spring-born girls and still nursing fall-born crias have an area where they do not have to compete for hay and feed with the mamas. Alpacas are very sweet and gentle animals, but even the sweetest don’t like to share their grain, not even with their own crias. The creep feeder is a proven feeding technique used with cows and goats as well as alpacas. I have been wanting to set up one for quite awhile and finally figured out where to do it. 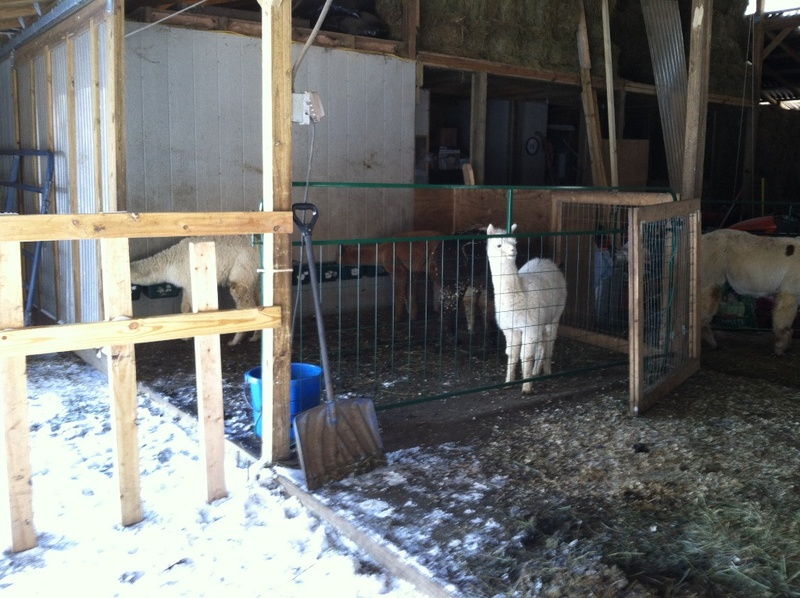 One side of our barn is set up with a 10 by 30 foot indoor section, that opens to our main barn pasture and a smaller pasture that we have been using for breedings or to keep alpacas that need special care or diets. 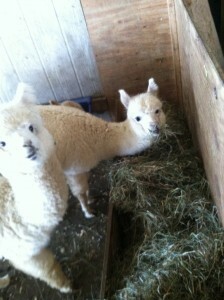 We’ve never kept our mamas and crias on that side of the barn, so I’d never imagined it as a weanling area. This winter, though we decided to keep our mamas and crias in the barn rather than move them up to their regular winter pasture. It is amazing what looking at your barn/pasture space from a new perspective will do. 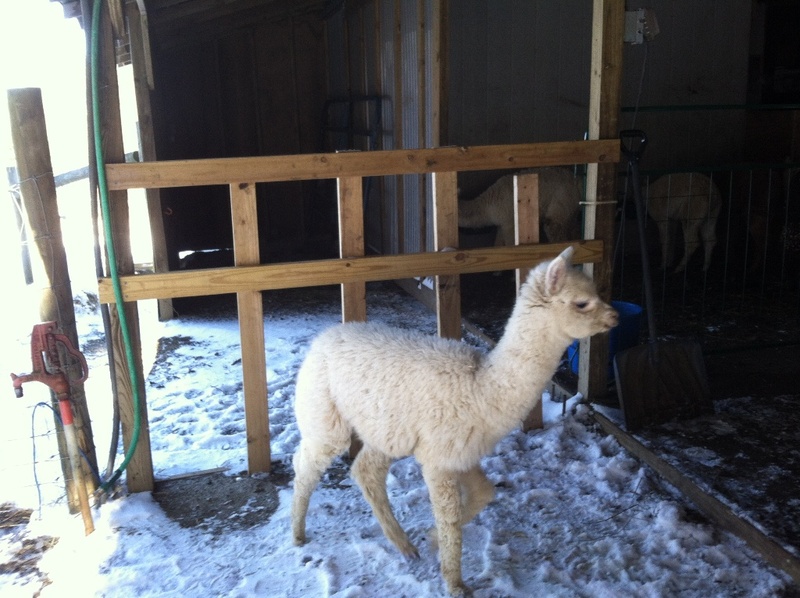 It quickly became obvious that we could easily set up a weanling pasture using the existing small pasture for our 4 spring born crias who were just getting used to being on their own. A metal panel is easily used to separate off the 10 foot indoor section connected to that small pasture, allowing the young girls to be near all the mamas and crias, while still having their own space. The next step was to create a pass through “creep gate” that would allow them and the younger crias to move in and out of the small pasture and indoor space while keeping out the mamas. 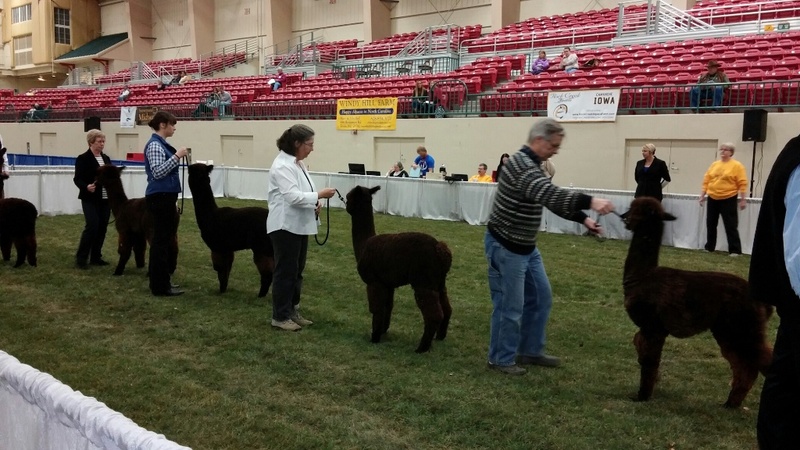 After researching alpaca creep gates on the internet, I had a good idea of the best height (most agreed on about 30 inches) and a range of suggested widths from 10-14 inches. 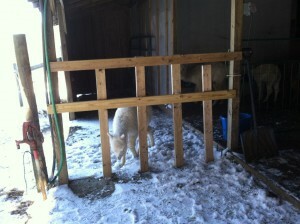 Armed with this information, I quickly built the gate between two existing posts of the barn. I started with horizontal boards at 30″ and 48″ (to discourage some of my very determined mamas from trying to go over the gate). 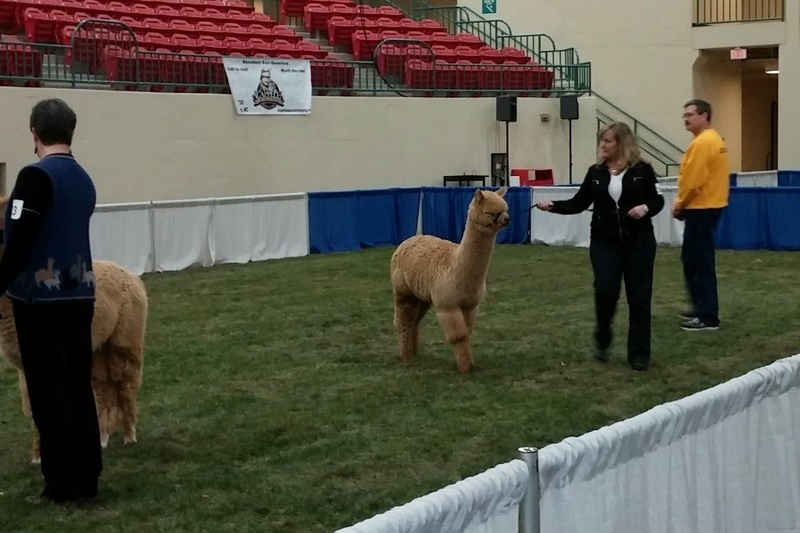 I put in several vertical boards spaced at 14″, 12″ and 10″ deciding I would watch the alpacas using the gate and adjust if needed. (I’ve seen the crias use all the spaces and no mamas have gone through.) The weanlings were already in the smaller pasture, but the trick was letting the younger crias know they could go in there to eat also. At grain time, I put out extra buckets and fed that area first. Everyone was interested. 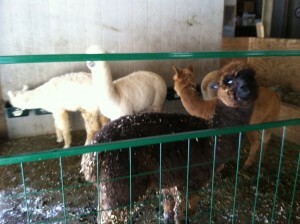 Then as the mamas were eating their own grain, I caught the crias one at a time and gently pushed them through the gate. Those already interested in grain were very quick to catch on and run get their share of the grain. Those not yet eating grain stood around bemused, and either checked out the hay feeder or headed right back through to mama. That relieved one of my main concerns, that the crias might not know how to get back out of the weanling area. The first day, I stayed until every cria had made their way back to mama’s side. 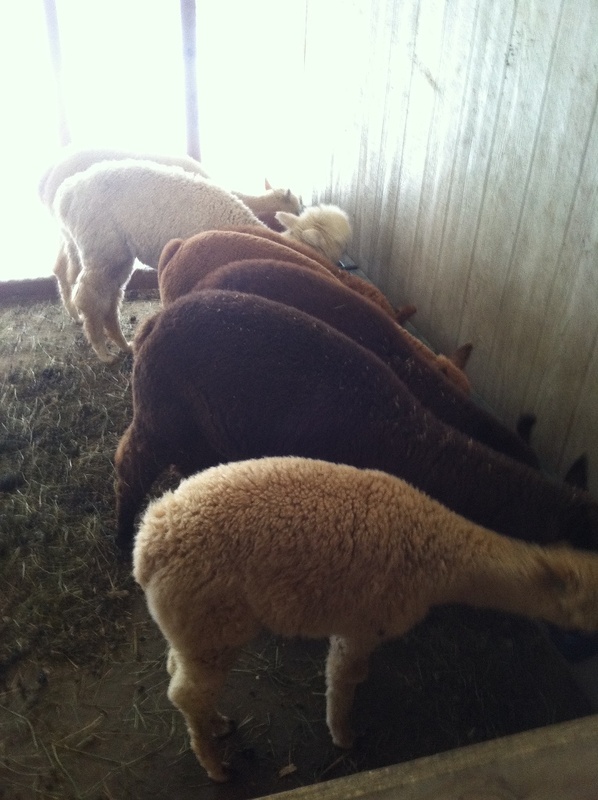 For several feedings, I would feed in the weanling pasture first, then help through the gate each cria who didn’t run in to eat on their own. Within just a couple days, everyone had it figured out. I still have two little ones who prefer mom’s company to eating grain and will occasionally encourage them to walk through the gate just so they know it is there. Most of the crias run right over as soon as they realize it is feed time. They have their own water bucket down low and their own hay feeder that usually has a little alfalfa on top, which is a big draw too. I often find them just hanging out during the day now that they have their own special area. The older weanling girls still prefer their own space. It took them quite awhile to realize that they too could go back and forth, and some were a little slower than others to figure out that they could get back in once they found themselves on the big girl side. (Bell is my smart girl and figured it out on her own.) The creep feeder has allowed the crias to put on weight faster despite our cold winter, and is taking some of the strain off the nursing mamas as their crias get bigger. We also have crias starting on grain and becoming independent faster than we ever have on the farm. I highly recommend setting up a creep feeder area. Update: After about a month of use, one of the mamas decided that she could squeeze through the 14″ section, so that one has been closed off. All the weanlings and crias, even our girls who were born in June, can fit through the 12″ section easily so that seems an ideal width.